I don’t think I’ll look at chocolate cake the same way again. I love chocolate. It’s my go-to choice for anything catastrophic in my day. I mean other than profanity, chocolate does it for family interactions, writer rejections, traffic, baby blowouts, college football losses and cliffhangers on some of my favorite AMC or FX shows. I love the cacao tree. It’s awesome, but what this lady did with it in cake…not cool man…not cool. Bad things should not be happening to chocolate cake. I went to another get-together in the afternoon and I didn’t repeat my food-a-thon from yesterday, but when I realized that they had chocolate cake, it was on. I was already thinking up an excuse as to why I needed to take two pieces home with me…you know, invent a relative that’s staying with me and say I’d like to take her some, knowing full well that I’d probably devour it at the stoplight. I grabbed my piece of cake, not a sliver, not a slice, a healthy ginormous chunk of the bad boy and began eating before I sat down. The texture was different. Something was different about it. It was softer, but something was different. When I asked where she got it, she said she had baked it herself. If you don’t have butter, don’t be making it. Or at least put a label on it and say this is my mayonnaise cake, dig in. Dude. Depression Era indeed. After hearing that I was depressed. In fact I was sick. All I could think of was a white vinegar-smelling blob trying to molest my chocolate. Apparently mayonnaise is an emulsion of ingredients that are normally un-blendable. Who wants that with their chocolate. I mean in a sandwich, I get it. Although I don’t really add mayonnaise to my stuff, I’m a deli mustard person myself. But I understand why people put it on sandwiches. 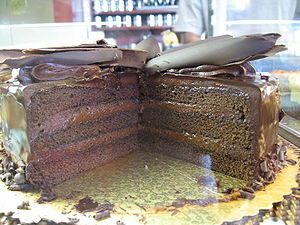 It was intended to be a spread, not a major ingredient in chocolate cake. I was completely grossed out. I mean I know there are eggs and oil in this white blob, but dude sometimes ingredients need to be mixed the cake way instead of forming a sandwich spread and then adding it to your cake as if it were pudding or frosting. I could feel my stomach yelling obscenities at me. It was one of those moments where you so wanted to throw up, but it doesn’t happen so you’re left with this sick feeling. I was grossed out the entire day until the little white, blue and green packet rescued my stomach. 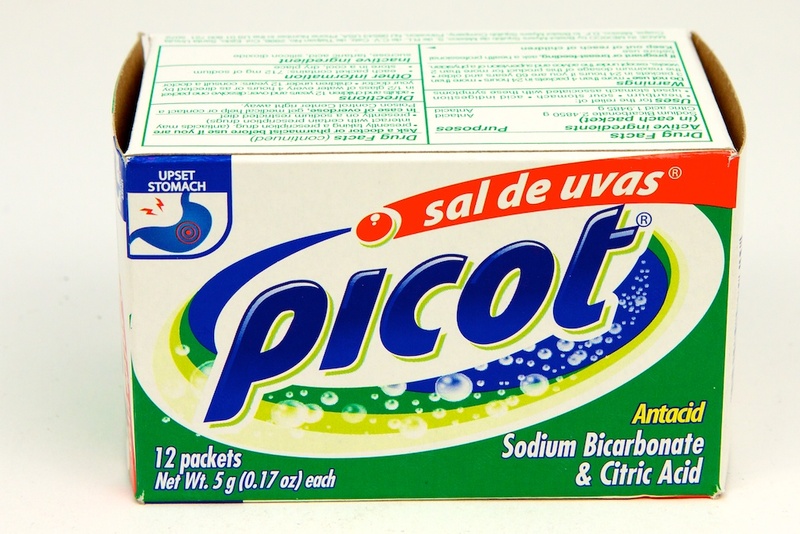 Sal de Uvas Picot saved me. It’s an antacid imported from Mexico. One of the best things other than their Tecate or Dos Equis beverages. It rebooted my system and was thankful we had some in the medicine cabinet. No more visits to Mayonnaise Lady. I don’t need anymore Tupperware, they sell Rubbermaid at Costco. Oh! My stomach is still upset about that chocolate tragedy. I’m not even a chocolate person, but the thought of mayo in a cake is off-putting to say the least. Glad you had the Mexican Rolaids to save you. Straight up! Mexican Rolarids Rock! Funny post! Thanks for bringing it by and livening up the party! OOoooOO! OoooOO! Man! No wonder people were so depressed in the Depression Era! Mass financial hardship and misery, 25% unemployment rate, farms either seized by the banks or crop lands drying up and blowing away in huge dust storms, and now this… Reduced to putting mayo in their chocolate cakes. Just don’t know how people could stand it, and go on living like that. But this person was putting the mayo in her chocolate cake willingly!!! Now that’s some seriously deranged nostalgia and just way out of control! People like that should come with a health warning tattooed on their foreheads. But while very shocking, you wrote your story in a shockingly amusing way. Good post, and I’m glad that I stopped by, cause I enjoyed it. Tecate and Dos Equis are both considered superior to Sal de Uvas Picot. Ask any knowledgable person of Mexican descent. It doesn’t get rid of the queasy stomach but drink enough and you’ll be too busy with your bladder to worry about your stomach. Chocolate Mayonnaise cake sounds so slimy. I’m glad you survived the ordeal! Erggh! I just threw up a little in my mouth. Mayo in a chocolate cake? OMG!! You have truly met the devil! I shall pray for you! This made my day. Thank you for living to tell the tale. I will experiment a lot and I even made a vegan chocolate cake that turned out amazing. But mayo? Hell no. That is just…. Why? Oh dear, you probably guessed a Pointdexter type would weigh in (oh h— rain not thy fury on my head) mayo in chocolate cake is …. I mean it’s just lemon, oil & egg. Butter is churned, just like mayo is, and … OK never mind. The tide of opinion runs against, and for me chocolate is best straight anyway, without being cut with too much flour and other stuff. Also, I can empathize with grossing out over a surprise ingredients. Funny post. Thank you to Susie for the opportunity to link and ponder the uses of sandwich spread. This is funny. I’m not sure about how this cake was made or how it tasted. But when I was growing up the neighbor used put a tablespoon of mayo in her chocolate cake to make it fluffier and moister. Oh … the cake … all I couldn’t even taste the chocolate. All I could think of was the globs of mayonnaise. I don’t know if it was moister or fluffier…all I know was that I was grossed out. OMG glad you survived the mayo cake incident that sounds so gross I enjoyed reading the post we almost all the time use sal de uvas for stomach issues it’s great man could you even taste any chocolate in the cake did they tell you after you ate the pieace of Cake or when you were eating it? It was totally not cool on every level. Sal de Uvas definitely rocks. My savior. And no they told me during mid cake. Mid cake! Oh. I was truly grossed out and my stomach was ready to beat me up for this monstrosity I put it through. Glad you enjoyed the story. Dude! I can’t believe someone would think about this. Did you mention that the depression is over and that she shouldn’t subject innocent people to this cake! I hate mayo on sandwiches, don’t be putting it in a cake.